Sometimes you need to get somewhere in a hurry, but a car can be an expensive accessory, particularly if you live in a downtown setting. Thankfully, there are plenty of alternatives to just taking a bicycle to where you need to go. Including plenty that look just look downright stupid. So if standing out in a crowd and making everyone think you're a damn fool is important to you, here's everything you need to get from point A to point B while looking like an idiot. Motorcycles are already dangerous enough, especially if you live and ride in a crowded urban setting full of cars who never seem to see you coming. So why not increase the risk factor 100 fold by getting rid of one of the wheels? That's obviously the thinking behind the monowheel. Speaking of single wheels, there's a really simple test to determine if you should be riding a unicycle in public. Just ask yourself if you're a busker who's currently performing, or just a lonely misguided soul desperate for attention. The sleek inline design of Rollerblades made rollerskating cool again. But who wants to go to all that physical effort and risk getting in shape? With a pair of these SpnKix strapped to your shoes you can ride for up to 40 minutes with minimal physical exertion. Scooters are for kids. The end. It doesn't matter how extreme or off-road you make them look, it will always be a mode of transport designed for children. The creators of the Rowbike pitch their invention as a cross between a bicycle and a rowing machine that combines the physical benefits of both. You can actually go somewhere with it, while getting an amazing workout. The part they leave out, though, is that rowing on dry land requires you to trade in all your self dignity and respect. Had the Segway been released with a reasonable price tag (i.e. not comparable to a small car) it would have had a far better chance at catching on with the public. And as it became more ubiquitous on roads and sidewalks, it probably would have eventually become an acceptable alternative to cars and bikes. 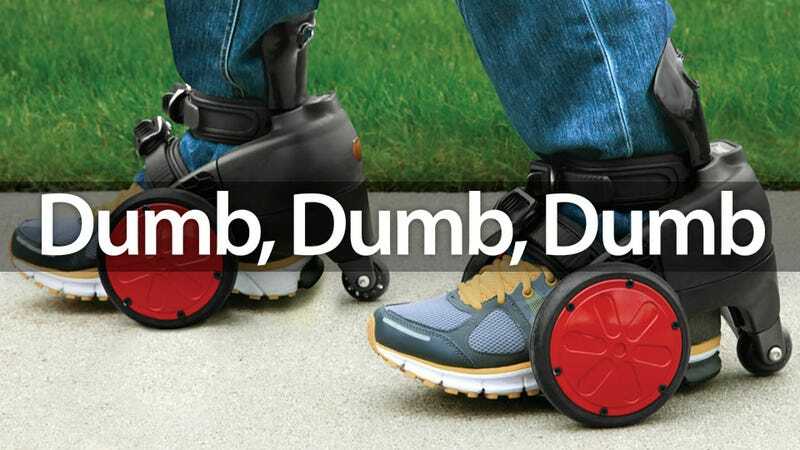 But believe it or not there is something worse than a Segway. And it's not a Segway with off-road tires, or a ridiculous seat accessory. Nope, it's a knock-off Segway. It will still cost you thousands of dollars, but not quite as much as the real thing. And everyone will know that as you whiz past.